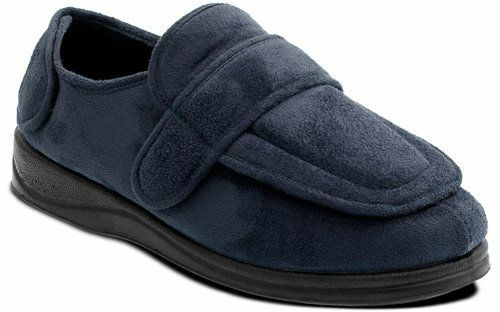 These unisex slippers from Padders are ideal for those with swollen feet and ankles. The two adjustable touch and close velcro straps allow the entire front of the slipper to be adjusted while the EE fit makes these suitable for very wide feet. The cushioned insole moulds to the shape of your foot to eliminate painful pressure points. The soft "wipe clean" uppers and vanilla fragranced outer sole will keep these looking and smelling fresh for a long time.